MOSCOW, April 14. /TASS/. 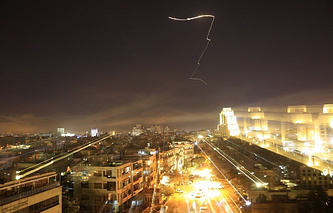 Not a single missile of those launched against Damascus ventured into the zones of Russian air defenses in Tartus and Hmeymim, the Russian Defense Ministry said on Saturday. "None of the cruise missiles launched by the United States and its allies entered the zones of Russian air defenses around Tartus and Hmeymim," the Defense Ministry said. Russia did not use its air defense systems in Syria to counter the missile strike of the US, UK and France, the Defense Ministry added. "The Russian defense united deployed in the Syrian Arab Republic were not used to counter the strike," the ministry said.